A lot has happened in those forty years. Current day CNC capabilities, vastly improved oils & coolants, as well as significant strides in tooling technology make the Gundrilling job easier, allowing capabilities not dreamed of a few decades ago. But the basics remain the same. The Handbook takes you down both paths, showing what's possible, while tempering your thinking with the basic and fundamental rules of the process. The result is a reference guide which provides all the tools you need to be successful in Gundrilling. It would take several hundred hours to compile all the information presented in the Handbook (we know this from our experience.) Whether you're a 'pro', or just starting to explore the process, the Handbook has all the real world answers you're looking for! 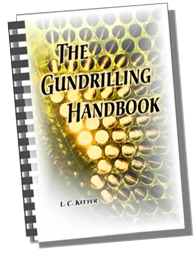 The Handbook covers the Gundrilling process in a simple, straighforward building block manner. It's spiral bound, compact format is designed for 'down and dirty' shop use. Call Toll Free 1-888-338-1049 - for delivery!